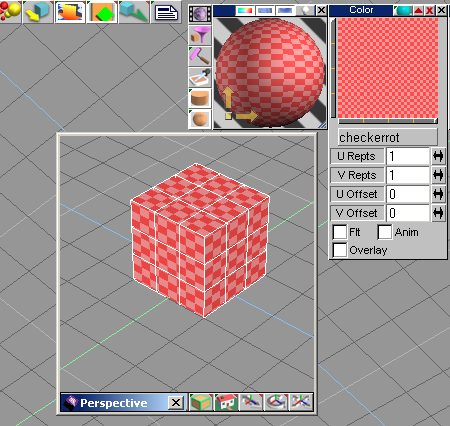 This tutorial is made with the UV Maping Editor of trueSpace 66. Should work with earlier versions though. But i cannot say how it differs from earlier versions. I have skipped TS 5, TS 6 and TS 6.5. 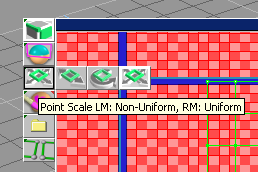 And so i was never able to have a look at the UV Mapping Editor there. Does TS 5 contain the UV Mapping Editor at all ? This Tutorial explains the steps to work with. I use a simple cube for that. 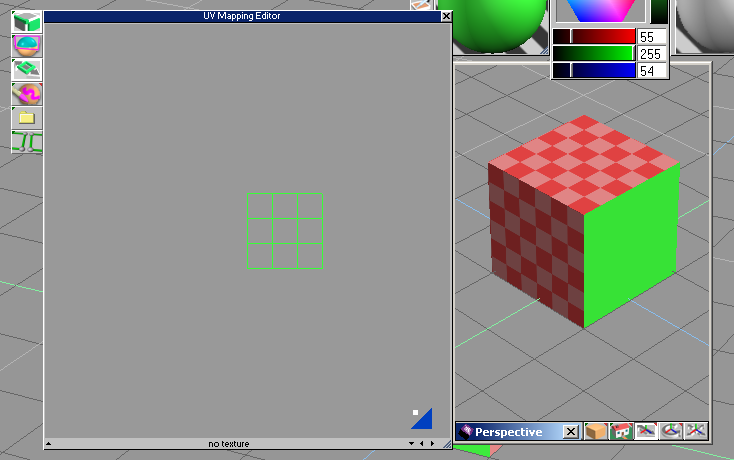 You could map such a cube without the UV Mapping editor, but it is easier to explain here. The needed tools will be named when we need them. 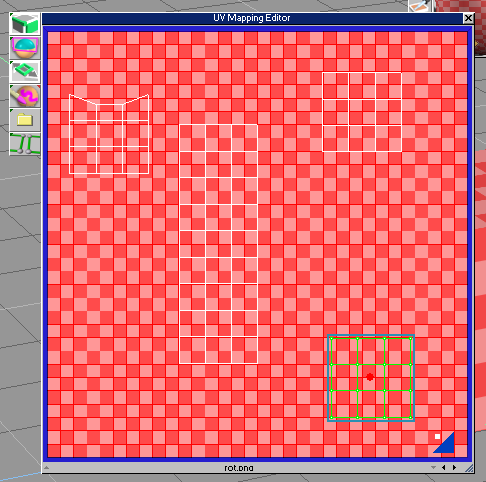 First a short look at the Options of the UV Mapping Editor. Nothing really worldshaking. 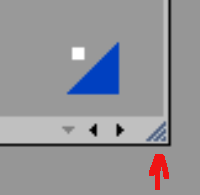 X und Y Button is to block axis. Which isn´t really necessary. See Move/Rotate/Scale. 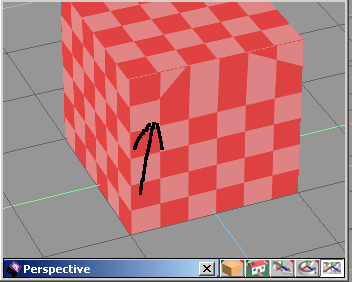 The Button with the grid at it makes the mesh invisible. The button at the very right hides a displacement texture when applied. The one that´s interesting is the one where you can read External Editor at it. Here you should search for the *.exe of your paint software when you prefer to load your texture into your paint software directly. Photoshop.exe for example. 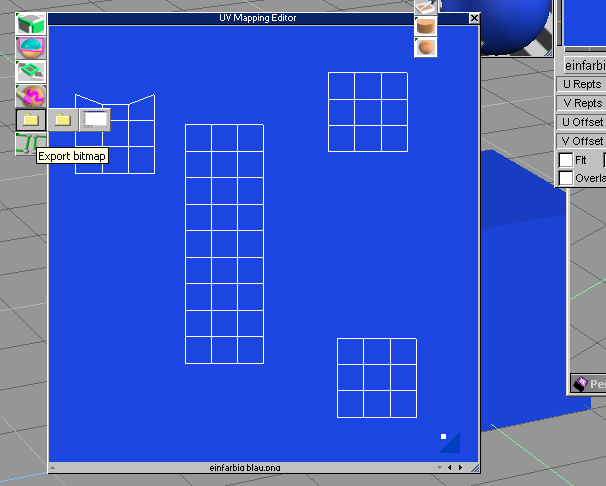 You can move around the UV Mapping Editor window like all other windows. The blue handler at the top. You can also adjust the size of it. But not by dragging at the border. You have to go to the lower right corner to find this lined field. Here you can grab and drag. 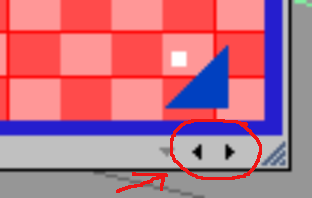 Left click at the blue trinagle, hold and drag, and you will move the texture. Right click, hold and drag to zoom in and out into the texture. Let´s do so. Move it, and scale it. To get a feeling for it. Sometimes the navigation button is in the way. So let´s have a look at the white little dot besides. Left click at it, and you can drag it around. Isn´t necessary in most cases. 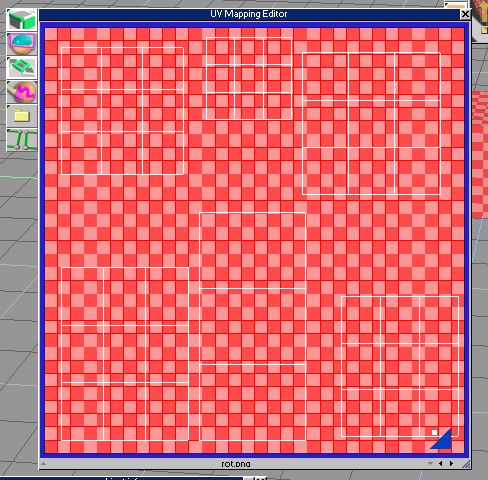 Time to have a closer look at the toolbar of the UV Mapping Editor. Let´s start with the select tools. 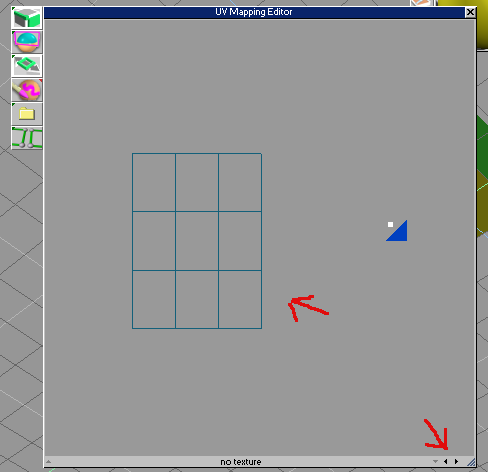 Activate Select using Rectangle, and mark the whole mesh with it. 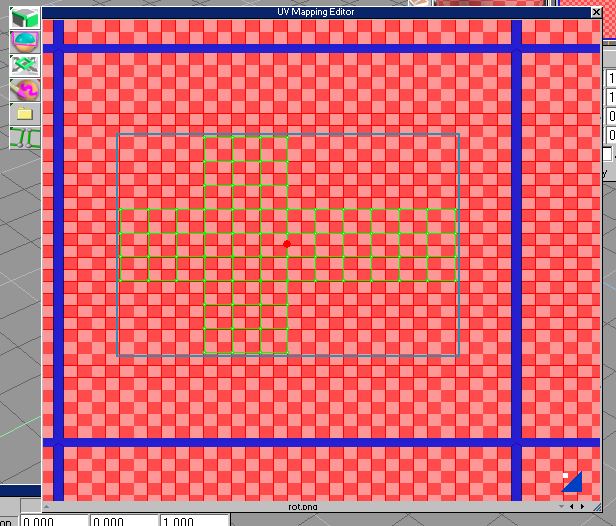 Now we have the whole UV Space selected. Nearly as in Point Edit. 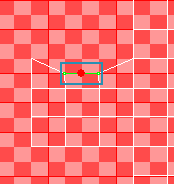 And now we can move/rotate/scale it around as needed. 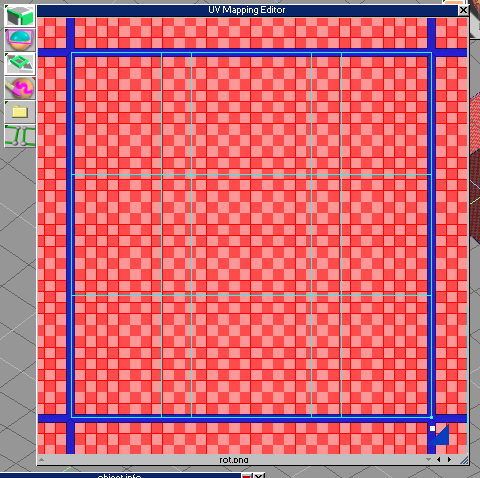 Note: The Grid feature doesn´t work in the UV Mapping Editor. So scaling can be a bit fuzzy. Because it scales freely. Take also care that you don´t get catched by this little buddy that rests in the middle of the selection. This one is thought to rotate the whole selection. Click at it and move the mouse, and you will see what happens. 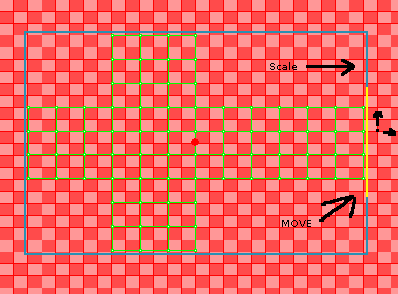 You cannot only scale the mesh, but also drag it around. Or rotate it. One way to rotate is the told center of the selection. Another one is the Rotate Button in the toolbar. There need to be a selected area though. You can also work with parts of the mesh. It´s somehow similar to the point edit. 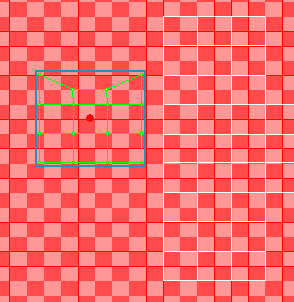 And like in point edit you can select Edges, Vertices, Faces and can move, rotate, scale them. Yuo can select more than one by holding down CTRL. One of the most needed features is the ability to separate parts of the mesh. 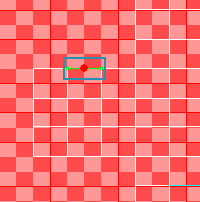 So that you can move it to another location of the texture for example. 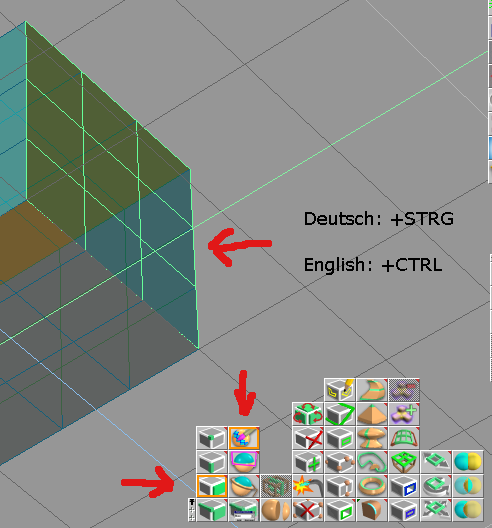 First let´s select a part of the mesh by rectangle. 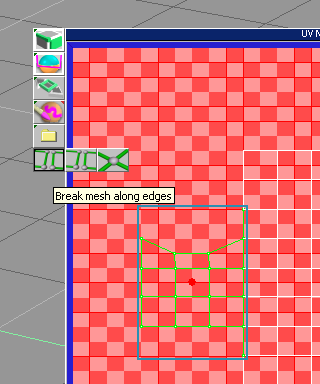 Then click at the Break mesh along edges Button. Or we can scale it. You can even overlap with another mehspart. But that´s no good idea at all when we work with Break mesh along edges. Because when we unmark this part, it becomes part of the rest of the mesh again. And then we are in trouble to select it. Rectangle would also select other parts underneath. And we would end in trying to catch this area face by face. There´s a backdoot though. You can go across point edit mode to catch this piece. Close everything, enter point edit mode, and select your faces there. 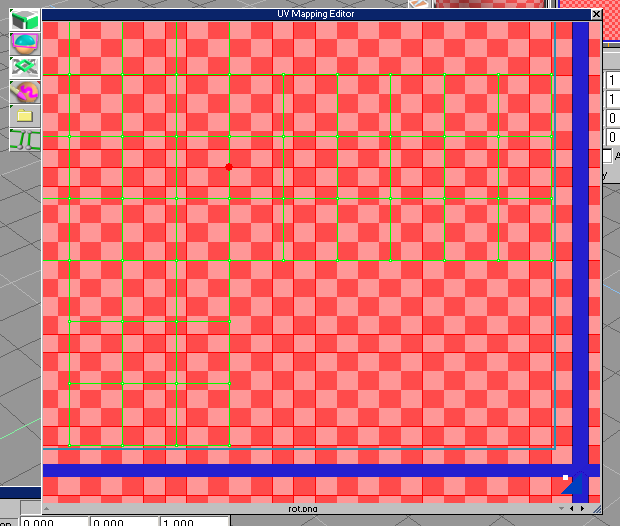 Then open the UV Mapping editor again. Only the selected faces are displayed now. And you can go on with tweaking. Anyway. We have disconnected this part for the CURRENT action, but it is still part of the rest. Well, there is fortunately a way to produce really independend parts where we can navigate then. 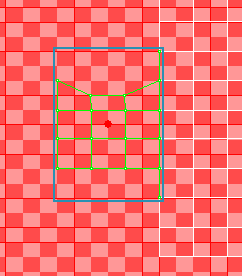 As told before there are some trouble points with navigation while working with Break mesh along edges. No real subpart means no way to navigate to it. But we need real subparts. So that we can overlap parts and work with it even later. 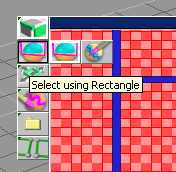 Or to select a part that is placed between others so that you cannot catch it with rectangle selection. Well, you could try to catch such pieces by freehand select. Or the formerly told point edit way. But that´s nasty. Having independand subparts is ways more handy. 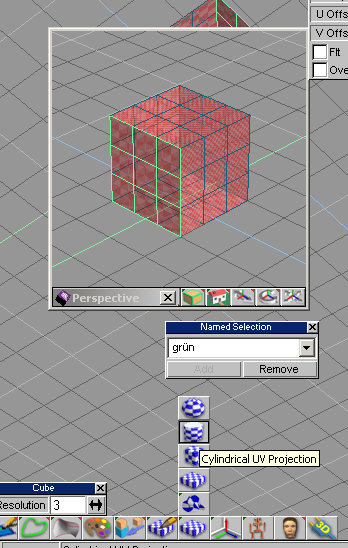 Currently clicking at it just makes the whole mesh greyed out. But we are able to navigate between subparts when we have more than one independend subpart. And that´s what we are doing now. We create such an independend subpart. Therefore we paint some faces with a flat colour. I will do that with a complete side of the cube, and with a green colour. 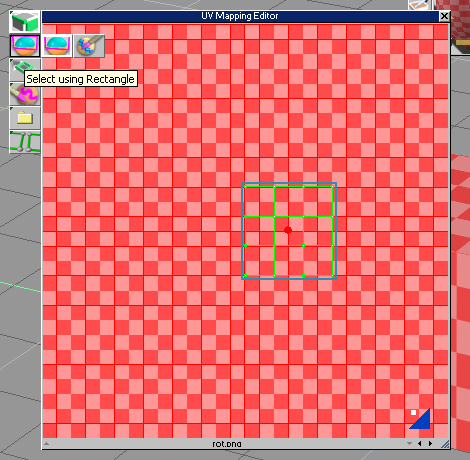 By reopening the UV Mapping Editor you will see the meshpart with the green colour at it. But our texture is nowhere. Wait a few moments. Therefore we need two other little buttons. With them you can navigate between the different materials of your object. The green painted part is missing now at the texture as you may notice. It´s because it currently has the green colour applied. Now the important step. 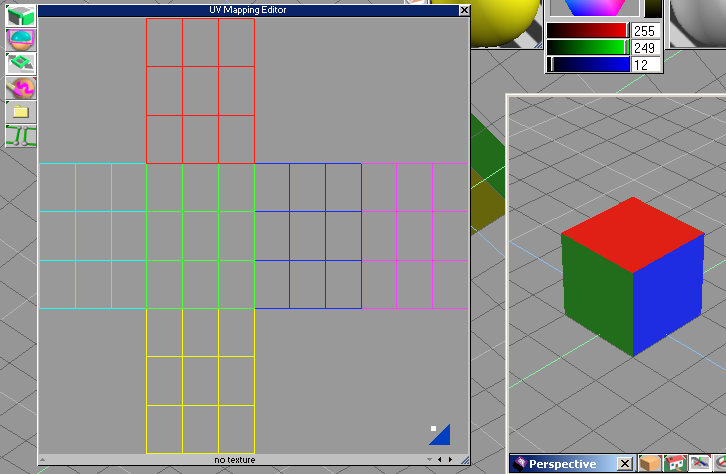 Close the UV Mapping Editor, and repaint the green colour with your texture. Attention! DON`T use Paint Object for that. You have to do that by Paint over existing material. 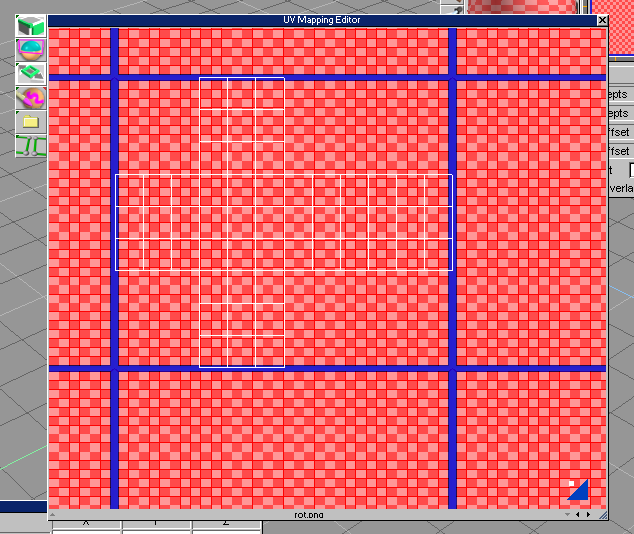 Else you will produce one complete mesh again. So beware! Let´s do so. Pick texture material, and paint over existing green colour material. 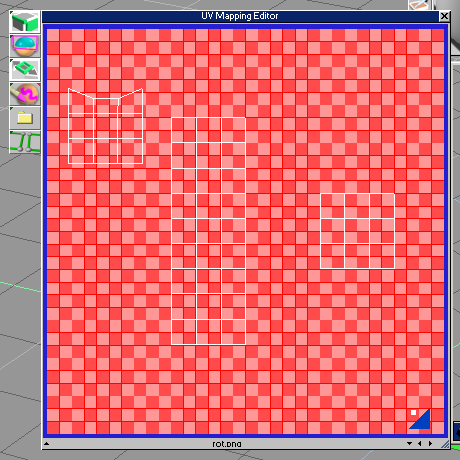 Then let´s reopen the UV Mapping Editor. Weeha. Our formerly green meshpart is back at the texture. … you are able to navigate between now really independend parts. Which means we can handle it independend now. 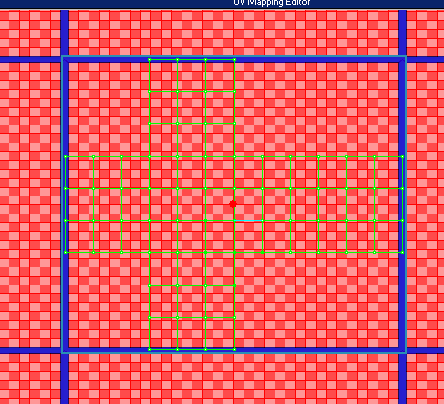 We can overlap this pieces and are able to move it away later. Without the hassle to select this part face by face. Here the independend part, marked, so that it is more visibly. Now move it to the location of your needs. Let´s separate the parts a bit more, and place it to different locations of the texture. The road to go is as above. Paint the faces you want to separate by a flat colour, then repaint it by paint over existing material with the texture. 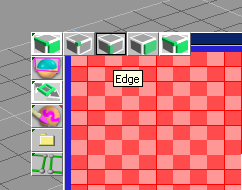 A save panel pops up where you can save your texture. Including the white lines of the mesh. And now you can go on working at it in your paint software. Because the white lined mesh gives you the areas to paint your textureparts at. You can also open this texture directly into your paint software instead saving it. 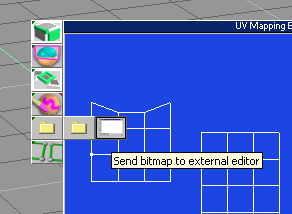 Therefore the Send bitmap to external Editor button is thought. I personally prefer to work external at the texture, with closed trueSpace. Too much open windows. But that´s your choice. 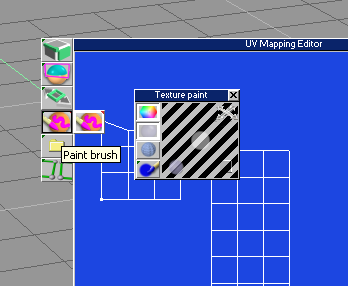 What´s missing in the descriptions of the tools is the Paint Brush Button. With it you can theoretically paint directly at the texture. I find it ways to limited. So why bother with that. Every paint software can do this job better. By rightclick you can open a little paint tool panel. Try it. Maybe you have a need for it. This way uses different colours to define different areas for different mapping. First we part the areas by different colours. And replace this colours by our texture afterwards. Let´s start from scratch. New cube. And we totally ignore the texture for now. Paint the areas with different colours. 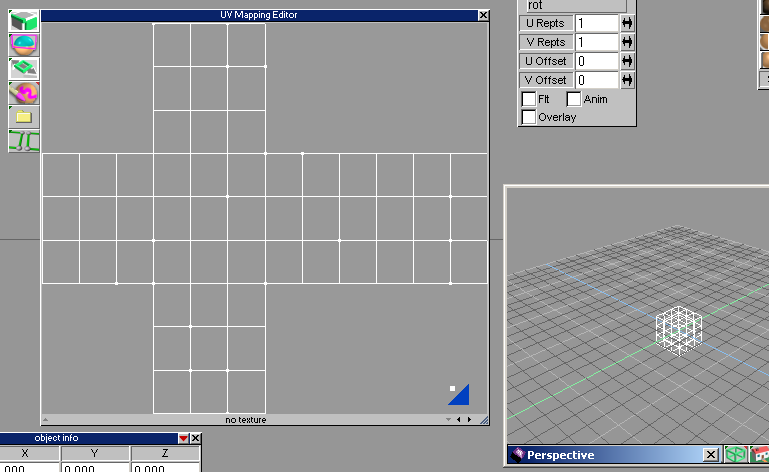 By that we have independend parts in the UV Mapping Editor. And so we can navigate between them. This becomes interesting later. On with preparations. 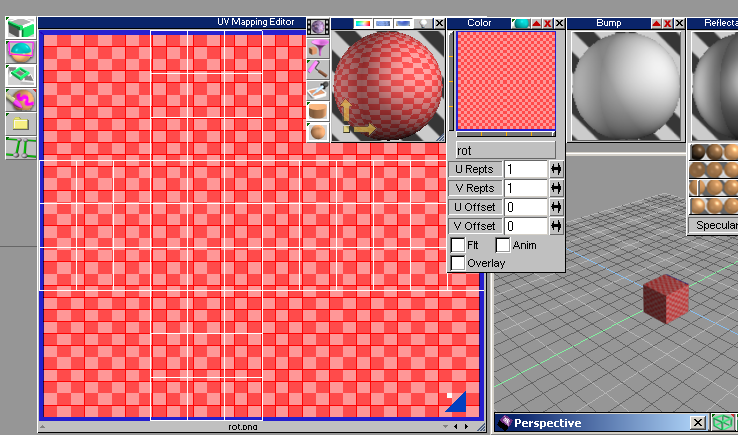 Close UV Mapping Editor. Let´s change the colours into named selections. We need the Facemaster plug for that. 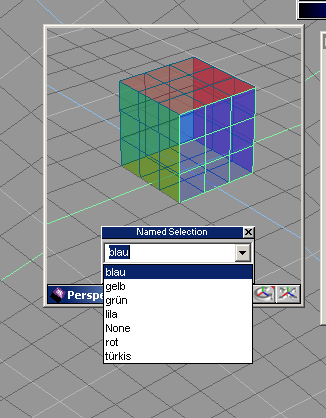 Because with this plug you can select meshareas by its colours. So there´s no need to select faces one by one. 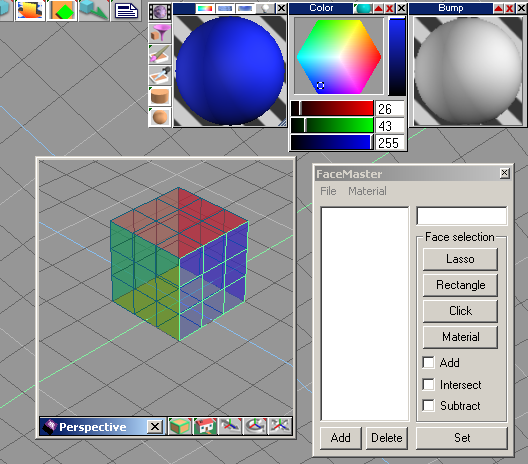 Pick colour, open Facemaster, and click at the Material Button. The faces with this colour are selected now. 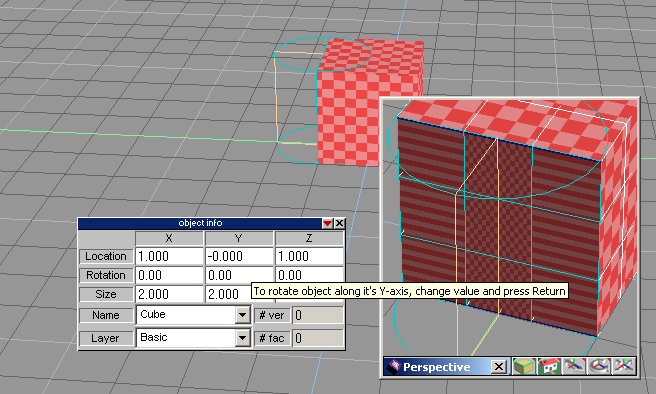 The trueSpace internal way is directly through point edit. 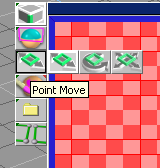 Enter Point Edit, activate Faces and Freehand, then click at a material at the mesh while holding down CTRL. Whoosh, all faces with this material are selected. Now we have our selection which we want to change into a named selection now. Here follows the step where we need our named selections. We give the different areas different UV projections. I have given the current selected faces a cylindrical one. The rest is mapped planar. 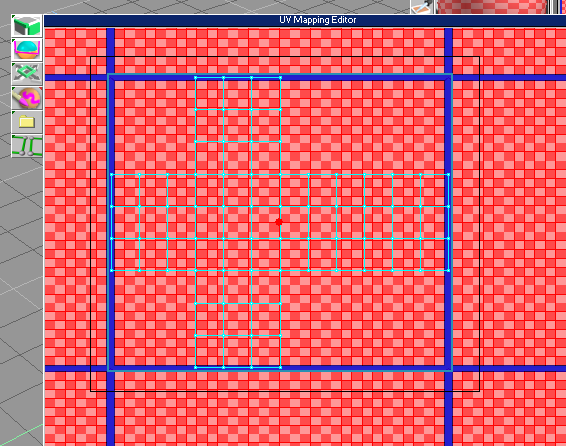 Let´s open the UV Mapping Editor and we will see the reason why we really need separated parts. The parts are overlapping. And you wouldn´t be able to sort it now. 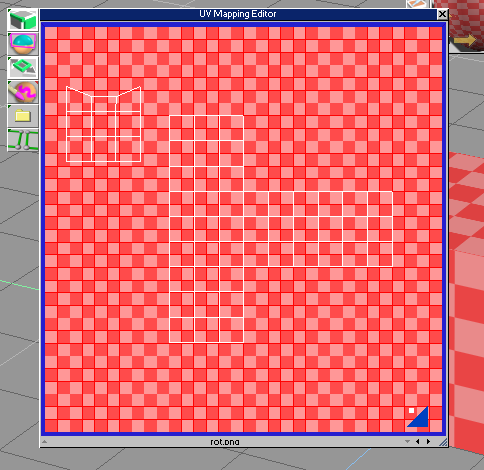 You should be finished with setup of the different UV projections, besides scaling. We want to place the single parts at the texture now. And touching one of the UV buttons would reset it to the current state. So keep your hands away from the UV Buttons after that point. 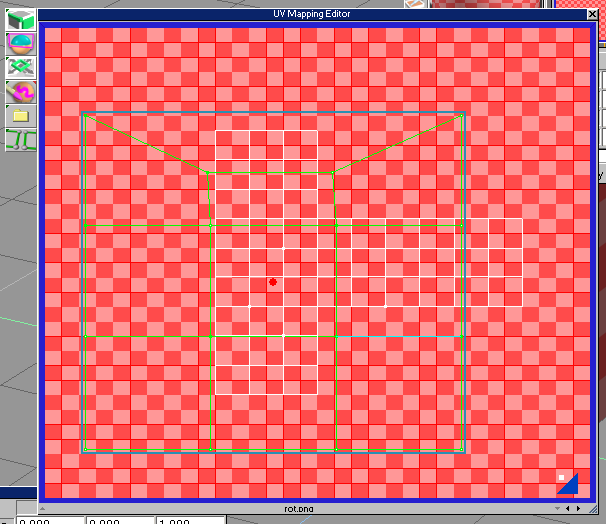 The fine tweaking will be done here in the UV mapping editor. When you need one part bigger, simply scale it here at the texture. Last step is to paint the object with a single coloured texture, to export it and finishing it in your paint software. What was explained by a simple cube could also have been a human mesh. With several textures, several independend parts, and several different UV areas and UV projections. The way is the same.